I met Hans Sonneveld when I was casting a Director of Photography (DOP) for my first feature, which I provisionally entitled Glenn 3948. Hans was a Flemish speaking director who looked more like a Peace and Love kind of guy than a real DOP. But there was something charming about him and, to be honest, he would agree to fit into our shoe-string budget (even though he negotiated a little after). Hans turned out to be a very fine, elegant and knowledgeable professional. Actually he was very involved and supportive of the vision I had, in spite of the fact that it was my first feature. The DOP is one of the key technical positions. DOP’s are responsible for the whole set lighting process, the cameras, and thus of all the machinery designed to help moving the cameras. They’re basically involved in anything and everything that appears in the image. They’re thus the alter ego of the director and are there to help him materialize his cinematographic intentions. Without them, no movie at all. One day that everything would turn against us and that I didn’t know where to find some hope, Hans thought me a thing I’d never forget, something he got himself from an older director, a Dutchman named Paul Cox, “In case of doubt, Marc, just take the simplest way. It’s always the best one!”. Way after principal photography was completed, and when I was close to see the first version of the movie, I gathered with Hans. We went to eat near the Brussels Stock Exchange building. That’s when he told me in his almost but not totally perfect French “If you make another movie someday, Marc, I’ll be happy to do it with you!”. To me this was solid as gold. I felt honored and I told him that I wasn’t sure the movie we just did would be as good as I hoped, but that I owed him and all those involved to make some day an extraordinary movie. Then Hans insisted on paying the bill. I knew he was not rich, and I was touched. A couple of months later, I was exhausted. Glenn wasn’t that good a movie (to know more, read the dedicated story in a previous post), and after an endless three-year long post-production, I had been struggling to get a theatrical distribution across Belgium. Eventually, one of the biggest theater owners, Kinepolis Group, finally agreed. It was huge for a little guy like me. The very minute I got the news, I called Hans. No answer. Then I called one of his technicians and the man just told me that Hans had passed away a couple of days before. I was stunned, devastated. I was in the Brussels Sablon area and I just walked, alone, crying, with no aim or purpose. This was so unfair. Only then I realized that when Hans insisted on offering me the meal, he already knew it probably would be our last one together. Hans was 51. He was a poet. He was my friend and I miss him, even now that I’m writing those lines, seven years later. 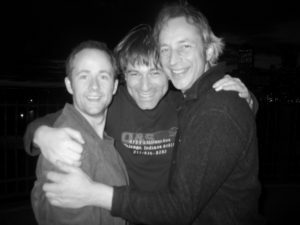 Hereunder, a picture of Hans, Billy Boyd, and myself, while we were guerrilla-film making in New-York, in January 2007.